Recently I've received a couple of awards which celebrate my fabulousness. The first award is the Pawsome award, given to me by my friends Max and JD. This award is presented to those dog bloggers out there who know the meaning of GREATNESS. Their blogs are consistently interesting, funny, or informative. Their KINDNESS is extended to others without expectation of its return, and their FRIENDSHIP inspires others to do EXTRAORDINARY things. These are the blogs you can't wait to read everyday. In short, they are AWE-INSPIRING, full of wonder, and simply PAWsome! 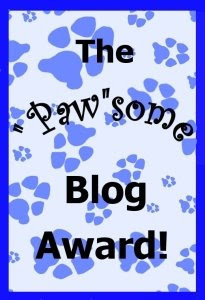 To accept this award I must paw it forward to at least four others who I feel exemplify a Pawsome Blog, and leave a note saying why I think they deserve the Pawsome Award! Unfortunately, all the pawsome bloggers I know out there already have one of these awards... except my cousins Bertie and Oliver, who inspired me to start blogging in the first place... so they deserve this award at least four times' worth! 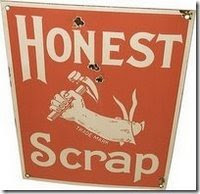 My second award is the Honest Scrap award, also given to me by JD and Max. To accept the award, I have to tell you ten honest things about myself, so here goes! I love meeting people, it's my favourite thing. My human says it's the only bad thing about me, because some people are afraid of dogs, and I always rush over to meet them anyway. She also says that if that's the worst thing about me, then I'm not doing too badly. I love tummy tickles. It's my other favourite thing. I own all the socks. Since it started getting cold, I own all the scarves and hats, as well. I haven't come across any gloves yet, but if I do, I'm pretty sure I will own them, too. I also own all the shoes. I'm thinking of branching out into underwear. I love squeaky toys. I get one and I make it squeak and squeak and squeak. My favourite time to do this is when my human is watching TV. Sometimes she has to rewind what she was watching, so I help her by making sure I squeak extra-specially loudly when she rewinds, to make sure that everything sounds exactly the same the second time around. Even when she rewinds several times in a row. I'm a very considerate puppy. Since the weather got colder, the grass in the park is all wet in the mornings, and sometimes frosty. I love running around like a nutburger through it all, and getting all wet and muddy. Then when my human carries me over the road (there's usually a lot of traffic by then), I like to give her big muddy hugs and kisses. I love my cousins Bertie and Oliver. I get so excited when we arrive at their house that I go all wiggly and wriggly and wag my whole body. Nothing in the world is as good as huggles with my human, when she picks me up and puts me on her lap and tickles my tummy and tells me what a wonderful puppy I am. I'm supposed to pass this award on to other bloggers that I'd like to know more about... so I'm going to keep my eyes open and my ears alert for some who haven't already received the Honest Scrap. Thank you so much for presenting me with these awards, and helping me celebrate my fabulousness. Hello gorgous Sasha - we liked your honest scrap list, what an affectionate puppy you are, we only wish we lived in the same continent so could share in some of the snuggles! Tail wags - JD and Max. Gosh, boys, think of the trouble... er... fun... we could have! You are quite a lovely little schnauzer. You sound as if you're doing a great job helping your person watch television!